Besides eating snow, there’s nothing better to do in the winter than draping your freezing body in a nice blanket, especially when you live in an icebox apartment. Admittedly, I have a problem. I own a dozen or more throws, including two perfect faux fur ones from Pottery Barn that I wear over one another while laying on the couch, immobile. In my defense, they’re essential because my apartment is a literal freezer around this time of year. Understand why I need these, too. 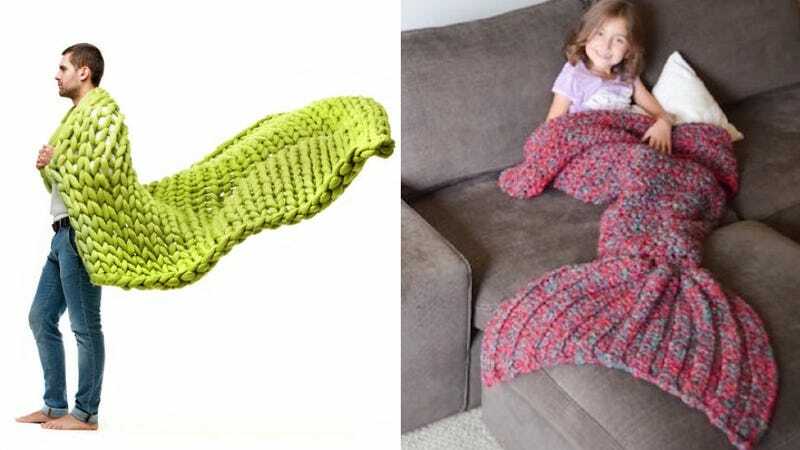 Of course, this item is sold out on Etsy because who wouldn’t want a mermaid blanket? Especially those of us who constantly complain about cold feet. Why didn’t anyone get this for me??? I saw this super chunky knit thing on Fast Company the other day and wanted to get lost in it...and then find myself. It’s just like a chunky sweater except bigger and instead of being a sweater it’s a blanket. It’s made by Ukraine designer Anna Marinenko and available for preorder on Kickstarter. I’m not quite sure why I don’t have it yet. The above blanket led me on a search to find more and that adventure led me to this U.K. site called Knitting Noodles. I don’t know who they are but this is handwoven and big and I need it. Also, it’s made from viscose, a material I just now learned about, which means this blanket is educational. Why don’t I own it? Homelosophy has a similar cozy knit blanket but it’s $725, which is dumb. But I need it. As previously mentioned, I already have two fur throws, but this Restoration Hardware one is bigger, looks incredibly warm, and would make me feel like a bear. I need it. We all do. We should all look like this in the winter.